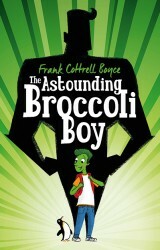 Find out why it’s not easy being green in the hilarious story from Frank Cottrell Boyce: The Astounding Broccoli Boy! Illustrated throughout by Steven Lenton. Rory Rooney likes to be prepared for all eventualities. His favourite book is Don’t Be Scared, Be Prepared, and he has memorized every page of it. He could even survive a hippo attack. He knows that just because something is unlikely doesn’t mean it won’t ever happen . . . But Rory isn’t prepared when he suddenly and inexplicably turns green. Stuck in an isolation ward in a hospital far from home with two other remarkably green children, Rory’s as confused by his new condition as the medics seem to be. But what if it’s not in their genes, or a virus, or something they ate? What if turning green actually means you’ve turned into a superhero? Rory can’t wait to make it past hospital security and discover exactly what his superpower might be . . .